A team from Samford University's Cumberland School of Law took first place in the regional component of the American Association for Justice (AAJ) Student Trial Advocacy Competition March 20-23 in Atlanta. This year, as in 2012, 2011 and 2008, it was an all Cumberland School of Law final as two teams swept first and second place. The win came just days after Cumberland School of Law ranked 6th in the nation for its trial advocacy program in U.S. News and World Report's 2015 Best Grad Schools. John Spade, Austin, Texas; Rush Thrift, Seneca, S.C.; Spenser Templeton, Gadsden, Ala.; and Matt Woodham, Montevallo, Ala., took top honors in the region over the other Cumberland School of Law team of Jessica Brookshire, Snellville, Ga.; Rebecca Hall, Huntsville, Ala.; Ben Odendah, Huntsville, Ala.; and Carl Williams, Murray, Ky. The winning team advances to the national finals April 10-13 in Santa Monica, Calif. This year's top team defeated Faulkner University, University of Georgia and University of Alabama in the preliminary rounds, Georgia State University in the semifinal, and then the other Cumberland School of Law team in the final. There are 14 regions of the AAJ Student Trial Advocacy Competition, and 16 teams compete in each region. A law school can send two teams. Only the top team from each region advances to the national Finals. AAJ's mock trial cases are always civil cases and deal with products liability, personal injury or medical malpractice/negligence issues. Teams are judged on their skills in case preparation, opening statements, use of facts, the examination of lay and expert witnesses, and closing arguments. 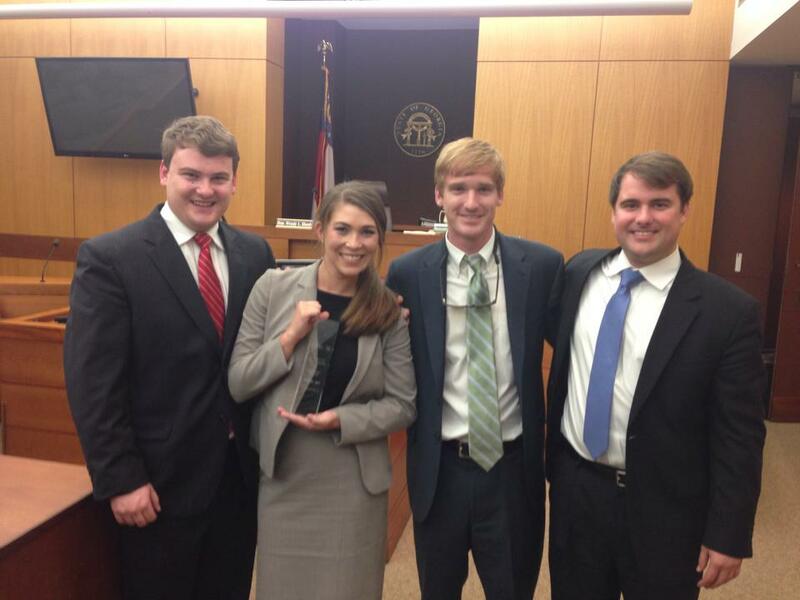 Cumberland School of Law was the national AAJ competition champion in 2012, 2008, 2000, 1987 and 1984, and placed second in 2009. In 2012, 2011, 2010, 2009, 2008, 2007, 2005, 2004, as well as nine more times dating back to 1982, Cumberland teams won the regional competition. The law school also recently won the American Bar Association's National Tax Challenge and its regional Client Counseling Competition. Cumberland School of Law's current teams are coached by Mike Rasmussen, a 1975 alumnus and 26-year advocacy coach with four national titles. Rasmussen was a federal prosecutor in the U.S. attorney's office where he prosecuted white-collar criminals for nearly 30 years. "Not only winning the AAJ regional, but having two Cumberland teams face each other in the final round to guarantee the school both first and second place, speaks volumes about the law school's dedication to teach superior lawyering skills," said Thrift, a second-year law student. Thrift said he entered law school with an interest in construction law. After taking first place in Cumberland School of Law's unique intramural Williams Freshman Competition during the spring 2013 semester, he remains open to explore different practice areas. "The trial team coaches bring years of real-world court room experience to teach us not only the rules of the courtroom, but also how to advocate effectively," Thrift said. He added that his education is preparing him to "leave Cumberland School of Law in spring 2015 not only knowing the law, but also ready to step into a courtroom and practice the law." Derrek Smith is director of communications for Cumberland School of Law.